Accelerometers are used for the measurement of acceleration, shock or vibration. You may be aware that there are different types of accelerometers; Compression Mode, Shear mode and Capacitive. All three types are vibration sensors – here is some more information on these three different types. A Compression Mode Accelerometer is made up of a sensing element crystal which emits a charge when it is under a compressive force. The crystal is bonded to a mass creating the internal sensing element. This is encased in a suitable body – usually stainless steel which enables the sensor to be robust meaning it can withstand harsh environments. The sensor then has an electrical connection which can be a sealed cable or plug socket. Compression Mode Accelerometers can be used in scientific and industrial applications. For example; predictive maintenance, aerospace, medical, automotive and process control. Shear Mode Accelerometers also use sensing crystals; these are attached between a centre post and a seismic mass. When under acceleration, the mass will cause shear stress to be applied to the sensing crystals. Using piezoelectric sensors, the stress applied to the crystals will result in a proportionate electrical output. This electrical output is then transmitted to either a built-in signal conditioning circuitry of sensors or directly to the electrical connector for charge model types. Shear Mode Accelerometers use sensing crystals isolated from the base and housing, this means that they excel in rejecting thermal transient and base bending effects. They are also smaller in size, promoting a high frequency response. Capacitive Accelerometers sense a change in electrical capacitance in response to acceleration. The sensing element of a Capacitive Accelerometer is made up of two parallel plate capacitors acting in differential mode. These parallel capacitors operate in a bridge circuit with two fixed capacitors and alter the peak voltage which is generated by an oscillator when the sensor is under acceleration. Detection circuits will capture the peak voltage which is fed to a summing amplifier to process the final output signal. 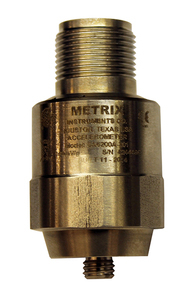 The Accelerometers we can offer come from our supplier Metrix. Each one is designed for a different purpose; high temperature, high frequency, underwater and piezo. You can see all of our accelerometers here. For more information on accelerometers please contact us.